Have you ever known guys like Zack and Jack? Or even BEEN those guys? I bet, if you've been a male in his 20's, you've been there. Because when you try to be hard and dispassionate, like James Dean or Steve McQueen -- which every guys tries to pull off at some point -- you end up being Zack and Jack -- a smirking, idle, ultimately unconvincing klutz who wants to be in control despite the fact that you don't know how to dress or feed yourself. These hapless mooks are the driving force of Down By Law, a down-and-out indie prison break buddy film from Jim Jarmusch. It would fit more into a comedy than a "Southern Gothic" slot, except for the fact that it treats New Orleans and the Louisiana bayou with grungy sentimentality and discontent. The film is both sparse and humane; it finds freedom in the hopelessness of the rural Southern landscape. If Zack and Jack are the wheels and the undercarriage of the plot, Roberto is the driver. He appears after everything has been set in motion, and he distinguishes himself from his new friends in almost every important way: he's not jaded, he's competent, he's not running from anything or reaching out for happiness beyond his own life, and he's absolutely earnest. He wins the trust of pretty much everyone he meets, starting with Zack and Jack and his audience. Like the previous movies discussed in this series (Sling Blade and Winter's Bone), Down By Law turns away from its subject at a pivotal moment: the moment of escape. This is a notable departure from other prison break movies, which tend to focus overly-much on the mechanics of the break-out. 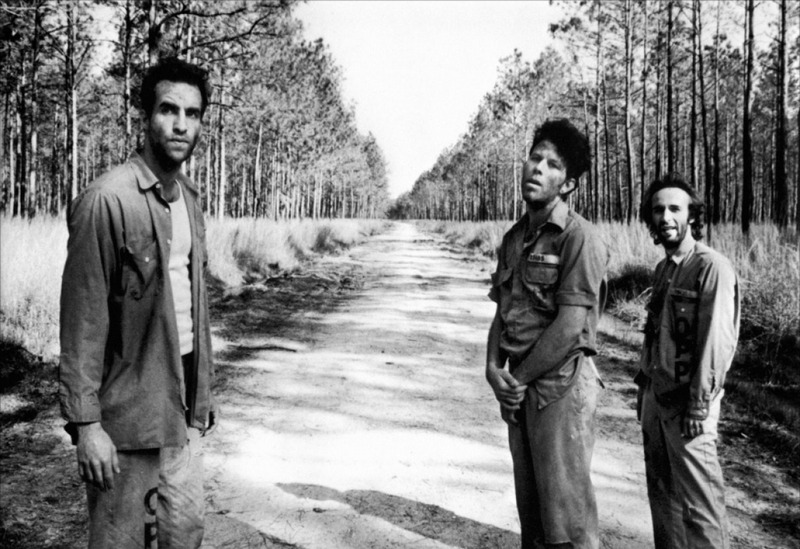 Just like with the murders, this film is about what leads up to that escape, and what happens after... the context and the consequences, especially as it relates to the lives of these three guys wandering out into the wilderness. Jim Jarmusch is mercifully aware that life isn't in the events, the big decisions and acts of courage -- life is in the interstitial moments, in those bunk beds that Zack and Jack find themselves returning to, first in the prison cell and then in the empty shack out in the bayou. Roberto is aware of this, as well, and he turns the mundane into the beautiful at every opportunity, relishing the chance to play cards, to cook, to dance on a kitchen floor. It's Zack and Jack, the perennial blockheads, who try to make their lives into a series of landmarks and dramatic changes of fortune. Zack thinks he can score big by taking up a driving assignment; Jack follows a tip to find a potential working girl in a hotel room. They start fights over stupid things, apparently trying to create drama where none needs be. Through Roberto's lazy triumphs, one after another, the universe seems to be screaming to Z&J, "Stop trying so hard!" Roberto, by contrast, is a sort of case study in the power of zen. He's never in a rush to make something happen... he befriends his cellmates through incorrigible persistence, and he tells them, almost in an offhand way, that's he's worked out a way to escape from the New Orleans prison. He doesn't get involved Z&J's squabbles; he accepts those responsibilities that fall naturally to him, like catching and cooking a rabbit as they travel through the bayou. He also accepts the task of entering the little restaurant on the road, and the universe rewards him with a kindred spirit. It's gratifying that his ending is a happy one, even if it's tangent to the clumsy forward-facing inertia of the two main characters. And of course those two main characters end the movie the same way they began it: on a quest for complication, a collision course with more drama and more unresolvable situations. When they part ways, each of them repeats his implicit promise to keep trying too hard, to keep wandering blind and stupid through the wilderness of the world, unable to embrace the contentment that follows friendship and loyalty. Now that they have left prison and Roberto and one another behind, they will continue down their chosen path into eternity.